Real photo post card measuring 3.25 x 5.25 inches. The paper manufacturer’s insignia on the back (Cyko, with hollow letters and no box) narrows the date range to 1915-1919. Otherwise no information. 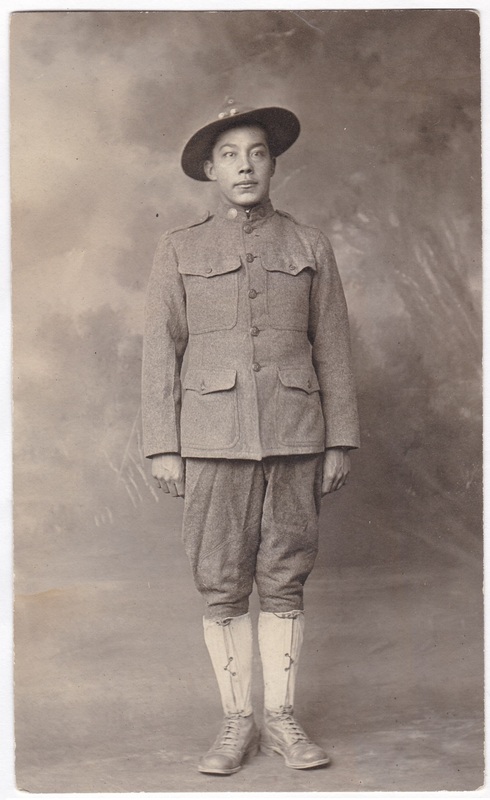 I’m definitely not a uniform expert, but from what I can tell, this is an American army cavalry uniform from World War One, in a photo from that time. It took a while for me to reach that conclusion, because the fact that he appears to be Asian launched me into researching the uniforms of other countries first. I then started to go down a rabbit hole of research into the roles of Asians in the US Army, but decided I’d better just post this picture so I could move on with my evening. As always, please feel free to correct any errors in this, or contribute any information you might have about what we’re looking at here. I’ve a nice civil war union soldier I need to send you. Oh, that would be wonderful! I’d give him a good home. Oh, thanks for this. I’m sometimes bad about updating when I get new information. And thanks for contacting your source in the first place. Much appreciated.